In the suburbs of Mumbai (Bombay) a special couple are doing an amazing and unique work. They are ministering to some of the thousands of street/slum dwellers. What makes the whole thing even more remarkable is that this COUPLE has next to nothing themselves! Their home is tiny, they have no transport and no guaranteed income yet despite that, they wash, feed and teach these destitute children daily. They are totally cast upon the Lord God Almighty. Shortly after being married, and it was in the first week of January 1992, they came to Bombay. There they rented a one Room - Kitchen shanty in Kandivli (East), in the Western Suburbs of that City, and began their work straight away, to the slum dwellers and homeless kids in the streets. They continued this on a day to day basis, using whatever resources were available to them. John and Asha voluntarily did reach-out to these vulnerable people in the city. Sitting on the roadside under the street-light John was teaching people in many locations. There came significant changes in the lives of these people !! Then came the need of reaching out the children. 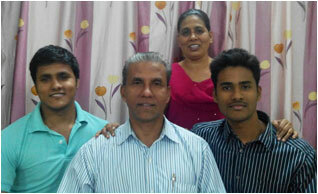 John and Asha Chacko are one couple that refused to believe that the condition of these children was hopeless. Their burden for them, motivated them to cast themselves totally upon God for the sake of these helpless and destitute children. Living with the slum dwellers and poor people they started reaching out thousands of people in and around them. Many people experienced the love and care through their day to day activities. John and Asha used to go in the houses of the most unwanted people in the society like the rag/trash pickers.